The Aiphone GT-2CS is an audio/video handset tenant master station for the GT series Multi-Unit entry system. It is equipped with Talk, Door Release, Option, and optional Service Button. This master unit will support up to three Aiphone GT-2H sub masters with the ability to communicate internally between the master and sub masters. When a visitor calls, the tenant station rings and video is present. The call is answered by one touch of the Talk button. A handset (GT-HS) can be added to the unit if additional privacy is required. 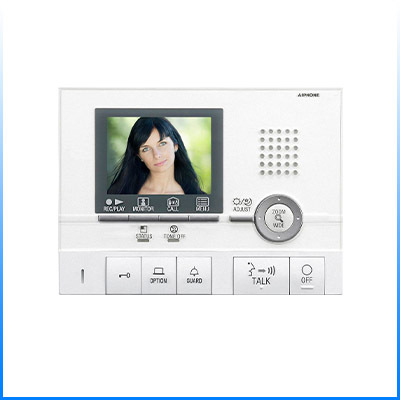 The unit features a 3.5" color LCD monitor, PTZ control button for camera, and picture memory to record visitor images automatically when a call is placed to the unit. A tenant video door station may also be added to replace peephole identification. The Aiphone GT-2CS is equipped with 3 programmable security/utility inputs, and 1 emergency input. The utility input will trigger the tenant station, while the security and emergency inputs will trigger both the tenant and the guard. Up to 500 total units can be used in one system.